Cut Type & Size: Cross Cut, 1/8" x 1 1/8"
The Kobra 300 CC4 is a powerful shredder that can shred up to 24 sheets per pass, allowing users to effortlessly destroy confidential documents like bank drafts, letters and more. This paper shredder is capable of shredding other media like Credit Cards with chip, CDs/DVDs, Staples and Paper Clips, without a hassle. 300 CC4 cross cut shredder creates cross cut particles of 1/8” x 1 1/8” at a speed of 17 ft./min. and at security level P-4. Kobra 300 CC4 cross cut shredder is an office shredder which shreds computer paper with tractor-feed margins through a 12” feed opening. It automatically stops with a light signal when the waste bin is full or if the cabinet the door is left open. The cutting head of this paper shredder can easily shred staples and paper clips. It has a 22-gallon steel cabinet for waste collection. Kobra 300 CC4 has a double motor drive technology which operates in conjunction with two “SUPER POTENTIAL POWER UNITS”, and delivers maximum shredding capacity. Elcoman presents Kobra 300 a professional shredder of the classic line. Kobra 300 shreds up to 46 sheets at a time, credit cards, CDs, DVDs and floppy disks. Activates automatically at material intake. Shredding can be stopped and reversed just by touching the stop button and reverses automatically in case of jamming. Convenient and safe 300 millimeter main throat. When the shred bag is full or door is opened shredding automatically stops with an optical indicator. 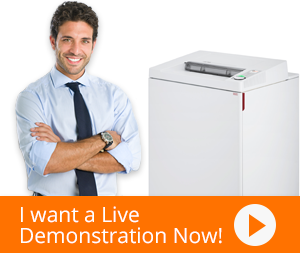 The energy smart energy saving system puts the shredder into a power saving standby mode. 85 litres steel cabinet. Straight or cross cut shred are collected into a recyclable bag placed on sliding tracks to make the empty operations easy. Cutting knives are made of carbon hardened steel unaffected by staples and metal clips. 24-hour continuous duty motor without duty cycle and a chain drive system with metal gears provides strength and durability over the years. Automatic oiler automatically lubricates the cutting knives.